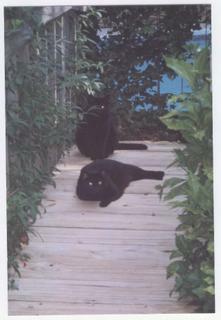 It is hard to take a photo of black cats, especially when you are an amateur with an automatic camera. I got these two from my daughter, who got them when they were two years old. The family they had been with since birth decided they didn't want them anymore - they wanted to raise dogs instead. If they were bad cats with nasty habits, I would understand. But these sisters are 2 of the nicest cats I've ever had, and I've had at least 10 over the years. When my daughter got them, one was named Storm and the other was Monica. This was about the time that the Lewinsky scandal hit the papers, and my dughter declared she didn't want a cat named Monica. So I suggested another weather-type name - and we came up with Eclipse, whom I call Clipsie. You would think with all that black fur, that they cannot abide the heat we have been having, but they seems to prefer it to the air conditioning. They will lie in the sun for hours, and when I touch them, their fur will feel as though it is ready to catch fire. At night, they wait for me to settle into my recliner, so they can nestle along side or on my lap. Lately, they have been denied that access, since I am on the computer so much. Wait until Big Brother starts next week, I tell them. Then we will have snuggle time! They are very lovely, do they have green eyes? Don't know what it is but lately I have just gone head over for cats with green eyes. You should post this entry on tomorrow's Friday's Ark. You can e-mail him your link from his site. I can try to walk you through it. Look on left top and click on "EMAIL MODULATOR". An email comes up. I put "Friday's Ark Entry" in the subject. Then I copy the URL address of my article permalink and paste it in the body of the email. To get to your permalink it looks like you click on the posting time. The address of the page it goes to will be what you email to him. I just add a little note to say hi. The first time I wasn't sure how to do it so I told him it was the first entry. Blogger doesn't have the trackback system and I don't understand that part anyway. Then just send the e-mail. I didn't have your e-mail or would have explained this that way. Hope that was "clearer than mud." Even at a distance, they look like they both have awesome eyes. Ah, they love you. I'm glad they are such sweeties. They are jealous of the computer though! Yeah, you did it! I see you over at Friday's Ark. You go girl! Adorable kitties. You're so right about how they seem to prefer heat to cold. Mine all do the same thing. The air is on in the house and they'll scramble and argue with one another to plop down in the one little sun spot that streams through the window! Cracks me up. You're becoming quite technically adept, aren't you? Aren't you afraid of the cats sucking out your breath at night?? Granny used to terrorize me over that when I had a cat. You have beautiful cats. Cats and dogs are our best buddies. I love pet posts! They are adorable. How do you tell them apart? It's sad when people get a cat then just ditch them. We got our cat at the humane socciety because the previous owner "did not have time for him". We have him now and love him to pieces so it is our gain but people need to be more responsible pet owners. They are gorgeous! 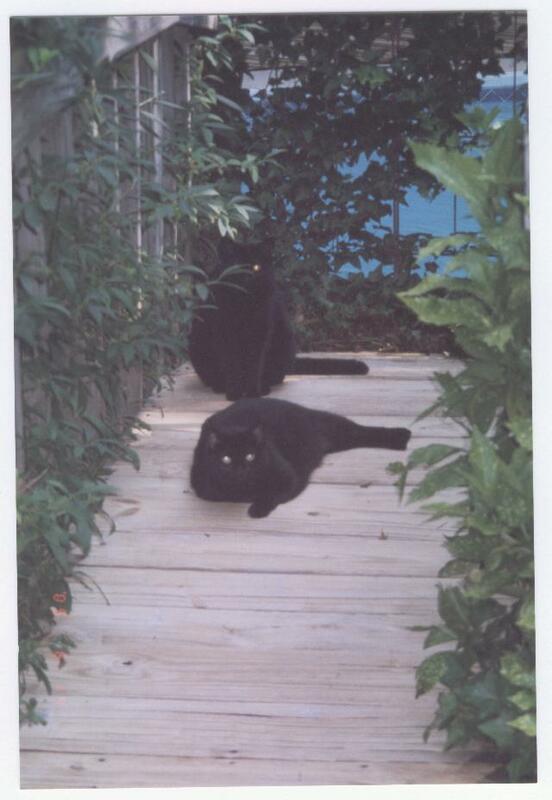 I used to have a gigantic black cat, named Charcoal. I loved him to pieces. Cats??? What should I say? We are allergic and they never do what you say. I like cats too, but haven't had one for 8 or 9 years because my son was allergic. Have a great weekend, came over from Michele's. I love cats, too (and dogs) I enjoy sneaking a dog or cat post on my blog when I get a chance! hello, Michele sent me. Kenju, always so lovely to visit you! Hope you have a fabulous weekend! Hi from Michele's this time. How do you keep black cats from crossing your path? You must be plenty agile. I'm not an animal person but I enjoyed reading about your cats. They sound lovely! We are about half way through our Big Brother here in the UK. I hope you enjoy yours when it starts! I'm going to read your wedding story now! I have a brindle colored dog (dark brown and black stripe) and she loves soaking in the sun! Thanks for visiting my blog. WLS = Weight Loss Surgery. I like how you renamed the cat. awww, such sweet kitties. I've definately more of a cat person than a dog person, unfortunately I discovered a long time ago that I'm allergic to them. So so sad, poor me! I don't have any pets at the moment, which is OK as I'm out at work most of the day and it wouldn't be fair to a cat or dog to leave it in the house for so long on its own. I've always wanted a tarantula though! I had two cats and a dog but had to leave them behind when I escaped from my house. I miss my kitties very much as well as my black lab. I loved my pets and they were MY pets dammit! We're just going into week 6 of our Big Brother which is rather heated this year...looking forward to watching yours aswell...I will be totally Big Brother'd out by the end of the summer! They're so cute. My cats used to look for a square of sunlight on the carpet and fight over it. I'm a Big Brother freak too! Although with my Sims obsession I don't know if I'll have time for it! Do you watch the webcams too? I just have one cat but he's more than a handful and yes, like yours, he's enjoying the heat! how sweet, they are really beautiful!